More then 500 troughs were erected in Australia mostly in New South Wales and Victoria, and some in overseas countries---England, Ireland, Switzerland [for donkeys] and Japan. Later a standard design was adopted, and Rolca concrete products supplied many hundreds of the troughs in Victoria and New South Wales. 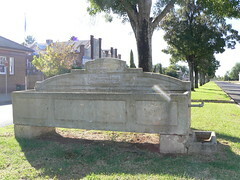 Troughs were supplied on application to the Bills Trust by Councils, and truckloads of 10 would often leave the Rocla Factory for installation by a team of men in country towns.